The founder works just about every task in the business. They find the clients. They do the production. They do the management. Everything. Then the founder starts hiring people. Employees. Vendors. Partners. Usually the founder continues doing major aspects of the business. Production. Management. Whatever. One thing that’s not often considered is the idea of an Exit Strategy. What If I Don’t Want To Exit? I’m kind of walking myself through this exercise and this is one thing that I thought about too. And you might be thinking the same thing. What’s the point if I plan to keep my business forever? Totally normal to think that way. But what comes into play here is the idea of creating an efficient business. One that operates as a machine. The founder can be a cog in that machine. The founder can be an important cog. Maybe even to the point where the business would fail without the founder. But that’s dangerous. It makes a founder feel important, but it means risk. It even means risk for the founder because if they slip in skill at all the business will suffer and they will suffer. An exit strategy gets a founder thinking about creating a business that operates smoothly without them. It doesn’t mean that the founder needs to leave, but it means the business is operating at a point where it’s efficient and effective. An exit strategy could be as simple as preparing the business as if you’re going to sell it. Or it could be that you’re going to hand over control. From yourself as the founder to a general manager or a CEO or someone that will run the day to day operations. It doesn’t really matter what they’re called. And obviously it could be something like an initial public offering or something like that. Whatever it is the idea is that you, the founder, are exiting the business. Now switch places for a minute. If you were buying a business or taking over a business you would probably be looking for a certain type of business to take over. Your business needs to be attractive to a potential buyer for the same reason. People that buy businesses want highly efficient and productive machines. Sometimes they want to buy something that’s underpriced where they think they can add value. But if that’s the case right now with your business then it’s even better because you have a lot of opportunity to improve the business. And you don’t need to sell it to improve. So what is the process for creating an exit strategy? It first involves a full audit of the operation. Everything that goes into your product or service to getting customers to hiring…everything. Every single step. It also involves what a potential buyer would call due diligence. They would make sure that your customers are actually your customers. They would make sure that your past financials are actually true. They would make sure that your employees are actually your employees. They would look at any debt and any receivables. They would look at everything and that’s your job now to plan the exit strategy. When you go through this audit you’ll discover a number of things. You’ll discover that there may be ways to improve the entire operation of the business. You may have been doing something simply because you’ve always done it, but after reviewing the process you realize you can do it differently or get rid of it completely. You might discover the most profitable aspects of your business. In other words, your strengths. And you may stop offering some products or services that are less profitable. You may recognize employees that are more important than you thought. You might need to offer them more money to make sure they’re happy. You may also realize that some employees may be better off in different positions. And you could see where you fall into the business. If someone else were to buy the company they might recognize your value. They may buy the company on the contingent that you stay on for a certain number of years on salary. 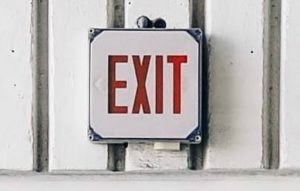 Creating an exit strategy may not seem like a worthwhile exercise. You may be thinking that you’re never going to leave the company. That’s totally normal. But going through the idea of an exit strategy gets you thinking about the operations of the business. It’ll help you find efficiencies and opportunities. And once you find and improve those your business is set to be better off than where you are today with an exit strategy.